To cut it short, the defining elements of Europe’s–and indeed the world’s–fastest growing creed, and the traditions and cultural values it imbues. Except for its interpretation by loathsome heretics like the Alevites, that is, persecuted to this day both by Shiites and Sunnis, being forced to keep a very low profile even in the, ugh, free world. However, when they dare to get fresh, like German Green MP Ekin Deligöz, who advocated against the veil, swift justice is an option. She lives under police protection now. Actually, everybody does who dares to criticise, abjure or oppose. Be it right-wingers like Islamic scholar prof. Raddatz, greens like Deligöz or socialists like the Council of Ex-Muslims’ head Mina Ahadi. Speak up, be heard, and may the (police) force be with you. There’s a Rushdie, a Hirsi Ali around every corner, though possibly less known, less articulate or with worse looks. The likes of Ian Buruma will explain, why arrogance and a lack of humility or scepticism are to blame. If cornered, they’ll qualify that to be at least a partial explanation. Who are we to throw the first stone anyway? Now, where does that abject description of reality fit, you ask? Saudi-Arabia, Iran, Afghanistan? No – everywhere. Are we alarmed, as the discourse on one of Europe’s most influential and dynamic social actors is severely crippled? No, we’re not alarmist crackpots. Besides, we keep a low profile on things Islamic too, so the onus is not on us anyway. “Religionen sind zu schonen,” as knows expert on all things suction related, Herbert Grönemeyer, “religions are to be gone easy on.” He was referring to the poor Taoists, of course, who lately had to suffer much abuse in the arrogant West. > It’s all very interesting, at least to me. It is certainly heartening to see these figures… to believe that humanity has made some progress, after all. Yet what about modern battlefield deaths, Auschwitz, Hiroshima, and so on? There were, of course, vicious wars fought in the medieval era, but they did not have the same fatalities and catastrophic effects of modern warfare. If one were to add those deaths, the chart would look rather different. Perhaps, in our Weberian age–an age of specialization and technocracy–the killing continues, but through other, sanctioned channels. Much better (and safer) to attack the Yankees than proponents of Sharia, Marek. Criticize Bush and the rewards are the accolades of all right-minded humanity, book contracts, etc. Criticize Sharia and you may wind up pinned to the sidewalk like Theo van Gogh…..
What I’d like to know is how the author found out what the murder rate in the year 1300 was. Hm, even in the worst of times the chance of dying of murder was 1 in 1,000. I don’t have exact numbers, but today’s chances of dying from cancer through chemicals from German cars or a heart attack from your German employer overworking you are much, much higher. I am glad the methods are so much more refined today. 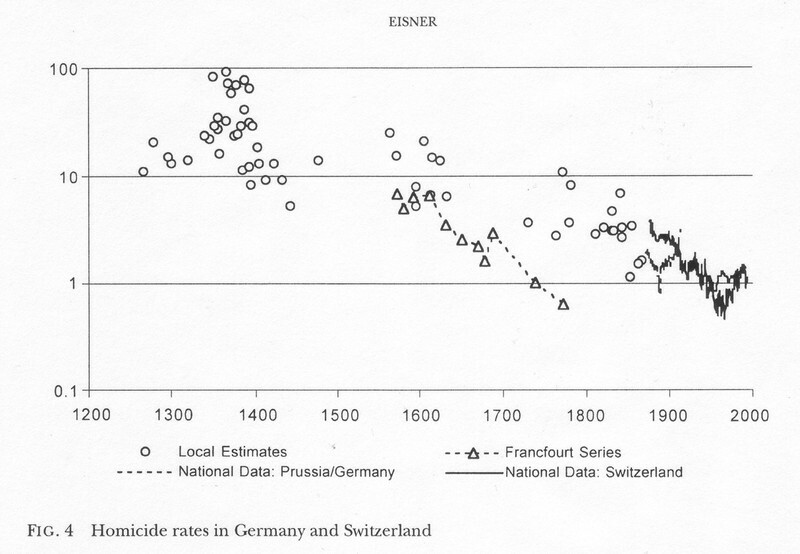 Hm, even in the worst of times the chance of dying of murder was 1 in 1,000. I don’t have exact numbers, but today’s chances of dying from cancer through chemicals from German cars or a heart attack from your German employer overworking you are much, much higher. This is so nonsensical it looks like a parody, but I’m afraid Martin made this comment quite in earnest. You will be surprised to learn that in medieval and early modern times, medical care was actually not terribly good. It was, in fact, mostly non-existant. What are these “worst times” you are talking about? From looking at the chart I would say it has to be the mid 14th century. That era (1347-1353) happens to be the time when the so-called Black Death ravaged Europe, killing an estimated 25 million of her inhabitants, or one third of the population. Somehow I doubt that the dreaded “chemicals from German cars” can hold a candle to the plague. Martin, please check wikipedia’s timeline of human life expectancy. As with all things wikipedic, mistrust is in order, but the numbers given corroborate my half-informed assessment, and likely yours too, so let’s accept them for the sake of the argument. Medieval Britain: 33, end of 19th century Western Europe: 37, and current world average: 67. And we knew that, didn’t we? That should be valid for conspiration theories too. I’m utterly wary of theories attributing groups of people, say, capitalists, the will to cripple their human brethren by elaborated schemes. While criticism of capitalism is in order (…and doesn’t necessarily lead to its rejection, IMHO), this idea amounts to, sorry, vulgärmarxismus. Sebastian, medieval life expectancy is a tad higher than that of classical Greece and Rome, though by popular notion the antiquity had more advanced medical science. Something’s wrong here, as is much of the concept of the dark Middle Ages – that Renaissance and Enlightenment did pop up out of nowhere is an ahistorical concept: vivant scholasticorum studia. Medical care in the Middle Ages and early modern times was not that bad, but only available to a few. Medical care in the Middle Ages and early modern times was not that bad, but only available to a few. No no, I generally stand by my assessment. There was nothing that would fit our modern idea of medicine, and very little that helped sufferers in practice. The history of healing begins in the 19th century, in Western Europe (note how this is also reflected by the timeline you mentioned). Cancer and heart conditions were already named, let’s add bacterial, viral, and parasitic infections. Medieval doctors did not even have a valid concept of these ailments, let alone effective remedies. An interesting discussion on historical kife spans. I was trying to work out why the average life span was lower in Classical Greece and Rome than in Medieval Britain despite Rome’s advantages in great public works as well as technologies like the hypocaust to heat rooms, etc. I think it had to do with social structure. Only the people on top lived in pleasant villas with all the best advances. for every member of a senatorial or equestrian family how many latifundia slaves do you think existed? Many, I’m sure. Slaves on latifundia were frequently worked to death (think of WWII work camps or the Gulag). They didn’t even benefit from the public baths or aqueduct water that the urban working classes sometimes did. I’m sure the senatorial classes lived a long time on average but their numbers were few….. In medieval england there were villiens who were tied to the land and a lot of independent farmers. The cities were cesspits of disease which killed many people but the urban population in medieval england was proportionately much smaller than in Roman times. More of the populace lived in the relatively healthful country. Another point is that England was a relatively advanced and peaceful country those times. If you averaged in the mortality in Russia, Norway, Italy, and France I’m sure the average mortality would be much lower. This is so nonsensical it looks like a parody, but I’m afraid Martin made this comment quite in earnest.Huh? Chemicals and workload are about humans killing humans, just like Andrew’s murderers. I don’t see how the plague or other effects of nature fit into this discussion. Progress in dealing with those effects would fit into the category ‘advances in the natural sciences’, not into the ‘civilizing process’ and other changes of society that the post is about. Huh? Chemicals and workload are about humans killing humans, just like Andrew’s murderers. No. You are talking about certain activities of men which, taken as a whole, result in potential health hazards which may or may not affect the average lifespan. I’ll go into this shortly. But how is this even remotely similar to a man choosing to end another man’s life right here and now with a weapon or with his bare hands? If it were just the same to us – just another instance of “humans killing humans” – then why would we care about murder rates at all? They are probably dwarved by all the other, uh, “killings.” Why, in fact, would we bother to talk about murder at all, why do we produce and watch movies that deal exclusively with the killing of single person? Secondly, it’s conceivable that in our modern day and age some health hazards have arisen that weren’t there before. At the same time mankind has eliminated or reduced a great number of health hazards, such as the risk of fire in cities, the catastrophal hygiene of early sewage systems, etc. – let alone, as I’ve mentioned, natural risks to our health. As a result the average life expectancy has greatly increased. Thirdly, it deserves to be mentioned that cancer in general is mostly a disease of civilization, but not because there are more carcinogenes today than there were earlier – rather because only under modern conditions do people live long enough to develop cancer. For example, the most common form of cancer in males is prostrate cancer, which almost never afflicts people under 40 or 50 years. (The second most common type is lung cancer, which is almost exclusively caused by smoking, BTW.) Without looking into it further, I would bet similar things could be said about cardiovascular diseases. To conclude: 1) Your equation of pollution with murder is absurd; 2) You brush off massive eleminations of health hazards and yet take relatively insiginifcant new health hazards as an example of “humans killing humans” more than making up for a decrease in murder rates. Sorry to be off-topic, but: Hahahahahahahaha… In my world (i.e., in the US), I get 13 days “compensated time off” per year. They picked this funny term because it includes both vacation and sick time. Granted, 9 paid holidays are on top of that but there’s neither overtime compensation nor bonuses for night or weekend hours. Meanwhile, my German buddies have 30(!) days of vacation, a 1.5 factor for night and weekend hour compensation, as well as full overtime compensation (through either taking off other times or receiving the monetary equivalent). At my latest count, there are also more than 9 federal holidays. Hahahahahahahaha… In my world …I heard in North Korea it’s actually even worse. I read just recently that as far as “Akademiker” are concerned, Americans work around 40-50% more (over a lifetime span) than (old) Europeans. It might well be true, if you take into account shorter studies, more weekly hours and less holidays. And still people in the US don’t seem to suffer that much from being overworked. It’s a different “ethos”. Americans also earn around 30-35% more than Germans, so it corresponds. As for the number of national holidays in Germany, it is in fact a joke. But for a politician to question them is to commit political suicide.